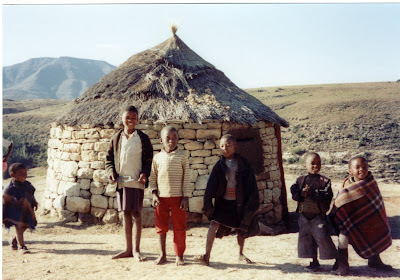 Went to Lesotho on the weekend (small mountainous country, the size of Belgium) which was awesome. Went with a couple of south african mates and drove down. It's one of the poorest countries in the world, with most of the people living in stone huts with straw rooves, without electricity or water. They all wear brightly coloured blankets and woolley hats (it's cold there due to the altitude and time of year). We stayed next to a small village and the people were amazingly friendly - everyone said hello to us. The mountain scenery all around was great. We did a few walks around and went horse riding. It was one of the best places I went to so far. Firstly the scene of standing in the middle of a village (where all the houses are made of straw) holding a crying baby and trying to stop it from crying as his father had gone off for half an hour. The second scene involved me sitting on a small fishing boat, with 4 fishermen, hitching a ride back to the mainland, with the floor boat covered in fish. Very random. I flew from Joburg to the capital Maputo, hired a car and drove up the coast (on my own). The roads in mozambique are aweful. From the airport there are no signs and no proper roads linking the airport to the main highway (which goes through the whole country). This highway is also aweful, with thousands of tyre shattering potholes. And I was driving a small Fiat, not a 4 wheel drive. I actually blew two tyres along the way (luckily I got the first one replaced half an hour before the second one went, so didnt get stranded). This was caused by the potholes. Mozambique is very poor - the poorest place I have ever been to and definitely the 'real africa'. People speak portugeuse and not much english which also made it interesting. Almost everyone lives in straw houses in small villages and everywhere you go you see women carrying containers of water on their heads from the nearest water supply. I drove up the coast to Vilankulos (which clive has also been to) which I really loved. There's some really beautiful islands off the coast. A mozambican who organises tours of the islands (on dhows - traditional sailing boats) took me under his wing and let me stay at his home with his family (in a straw village). It was great to stay with his family and have meals with them. On one of the days I followed him round as he went about his activities in hos 4WD - from organising the logistics of his boat to speaking with his friends. A bit like work shadowing, mozambican style! Also great insight into local life - he was 30 years old and just married a 16 year old girl (and they already had a 3 year old son...). We went into one of the nearby villages and bumped into one of the local girls who he had another child with (birth control isn't big, but promiscuity is!). This was the child I referred to above, who he left me with for a while and who was crying. I asked him how many kids he had and he laughed. Then he told me he had 4 and that "there are a lot of girls in the village...". apparently his wife wasnt angry. No wonder HIV is running between 25%-35% across southern africa. The mozambican guy did a lot of trading of time with his dhows - a bit like a local Dhow Jones.